According to the Knot, the national average cost of a wedding in 2017 was $33,391. With this high cost, it's no wonder that the majority of couples will cut costs wherever they can. When prioritizing your budget, wedding party favors is a great area to save money on. We have put together our favorite unique wedding favor ideas that your family and friends will love! Who doesn't love food? People love receiving gifts that they will use and olive oil is a kitchen staple - even amateur cookers will enjoy this gift! Traditional olive oil can be taken one step further by infusing it with flavors such as rosemary, garlic, or roasted red pepper. Allow your guests to choose which flavor they want so it will complement their cooking the best! Olive oil would be the perfect gift for outdoor weddings or weddings in a vineyard. Homemade salsa is another wedding favor option that is easy to make and low-budget. Salsa is also a kitchen staple and something that won't last long in the kitchen! A gift that is perfect for nature lovers, plants are inexpensive, pretty, and can double as decorations for your special day. 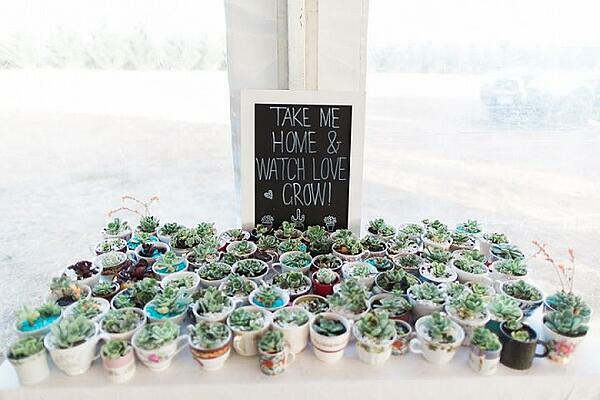 Succulents can be placed into little planters and used as place cards for guests to see where they are seated. Besides succulents, other plants such as aloe, cacti, and bamboo are low maintenance plants that are hard to kill. Instead of giving out the usual bottles of champagne or wine, give out mini bottles to each guest! A cute label can be placed on the bottles for an extra special touch. If you're looking for something nostalgic, mini coca-colas can be customized to include your names on them. If you're looking for an all-in-one entertainment solution, wedding slide show, and party favors, you should consider saying 'I Do!' to a photo booth! TapSnap offers completely customizable photo booths that will wow your friends and family! Whether you want the photo booth to match your wedding colors or you want a green screen that says your name on it, TapSnap has been providing couples with spectacular experiences since 2012. Each photo booth rental comes with social sharing, an online album, and unlimited high quality prints so your guests will be able to save the wedding memories forever! If you're curious about the features TapSnap offers, you can find out more by exploring out our features page or by checking your date below!